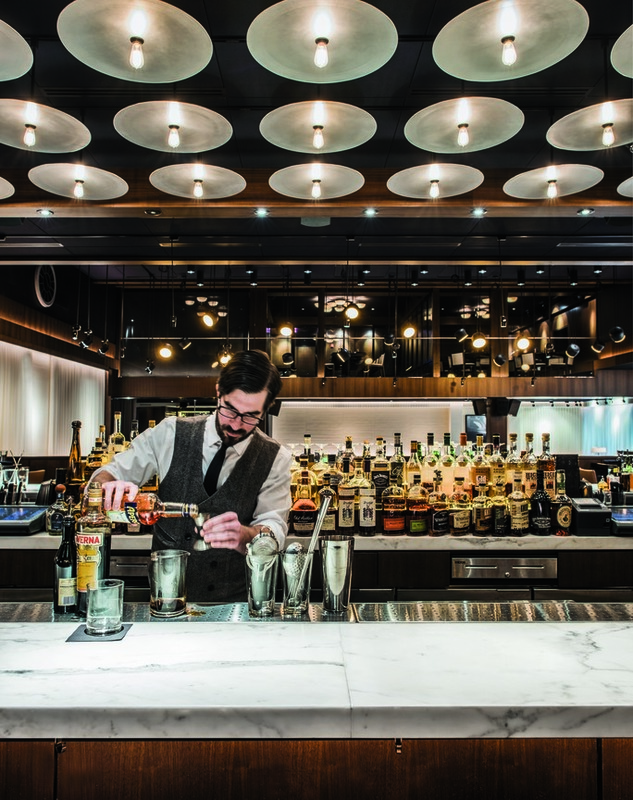 The Windy City continues to flourish with a wide array of top-notch drinks and dining options. For decades, Chicago has been a major force in the food and beverage world. “I can’t think of a place where there are more talented people doing such interesting things behind bars and in kitchens,” says Jerrod Melman, executive partner of Lettuce Entertain You Enterprises and managing partner of 11 restaurants and lounges in Chicago. Indeed, big-name Chicago chefs like Grant Achatz, Rick Bayless and Stephanie Izard and such mixologists as Paul McGee of the tiki venue Lost Lake shine bright in the national spotlight. Last fall, GQ proclaimed Chicago the “Greatest Drinking City in America.” And the James Beard Foundation—which crowned Paul Kahan of small-plates pioneer Avec “Outstanding Chef” in 2013—hosted its annual awards gala and reception in Chicago last month. This event marked the first time in the awards’ 25-year history that the ceremony was held outside New York City, and it spoke volumes about the importance of Chicago’s culinary scene. Still, Chicago’s booming food and beverage culture continues to get overlooked—perhaps because it’s situated so far inland from both coasts or because it lacks New York City’s 24/7 bar scene and Los Angeles’ year-round bounty. But the Second City certainly isn’t suffering an inferiority complex. Ask Chicago locals to describe their hometown, and there’s a good chance they will proclaim it a “city of neighborhoods.” While this moniker may seem vague, it rings true for the hospitality scene. “The industry is incredibly neighborhood-driven,” Melman says. “You really can find everything here.” There are Chinatown’s perpetually buzzing dim sum parlors, Greek Town’s traditional tavernas, Pilsen’s hole-in-the-wall taquerias, Devon Avenue’s 10-block stretch of Indian and Pakistani eateries, the Polish Corridor’s sweet-smelling bakeries, and Little Italy’s red-sauce joints, including some that were once Al Capone’s hangouts. While these areas ooze old-world charm, a warehouse district called the West Loop that’s adjacent to Downtown commands the most buzz. As the area fills in with independent retailers, luxury condominiums and tech firms—including Google, which will open its 357,000-square-foot office in early 2016—the West Loop’s dining and nightlife offerings seemingly increase by the day. 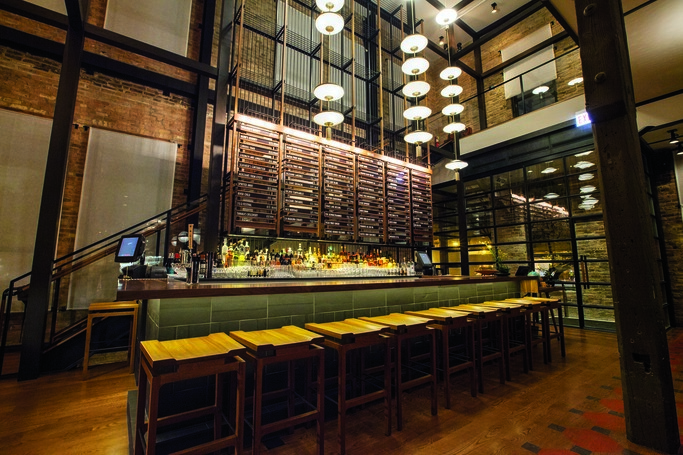 “The more businesses that enter the West Loop, the more compelling it becomes for operators to open here and for people to spend an evening out in the neighborhood,” says Erin Phillips, director of operations for Boka Restaurant Group. The company owns three restaurants in the area—Japanese newcomer Momotaro and chef Stephanie Izard’s Girl & the Goat and Little Goat Diner—and plans to open two more this year, including an 8,000-square-foot steak house on the ground floor of the Google building. 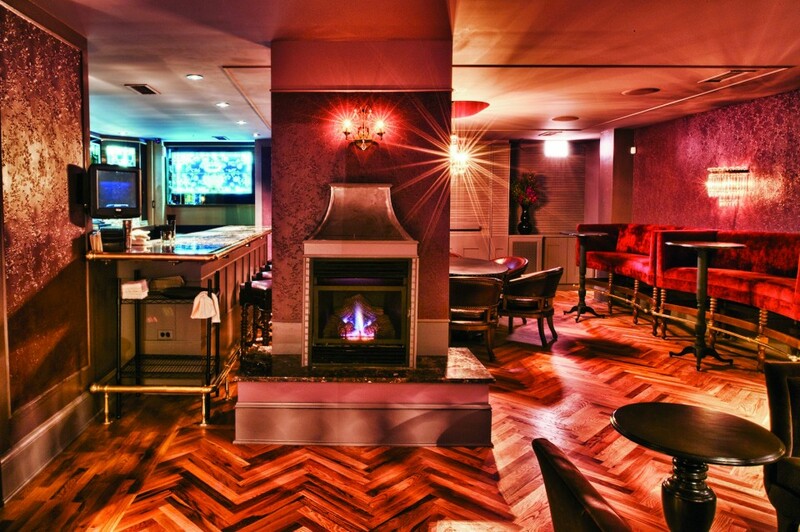 Barrelhouse Flat (interior pictured) often welcomes mixologists from other venues to work a shift, promoting collaboration and helping the Chicago bar community stay in close contact. For better or worse, Windy City cuisine is closely associated with deep-dish pizza, the Chicago-style hot dog and the Italian beef sandwich. These items may not be culinary masterpieces, but they hold a special place in locals’ hearts and reflect the city’s ethnic and working class roots. “There always has been an incredible work ethic in this city, and the idea of ‘Midwestern hospitality’ is very real,” says Melman, who—as the son of Lettuce Entertain You founder Richard Melman—was raised in the industry. Today, the 44-year-old Chicago-based company operates more than 100 properties spread throughout nine states and Canada. Pizza and hot dogs aside, Chicago chefs turn out some of the country’s most avant-garde fare. Abraham Conlon and Adrienne Lo of Fat Rice—one of Bon Appetit’s best new restaurants of 2013—continue making waves with their Macau-inspired cuisine. At the 1-year-old restaurant Parachute, Johnny Clark and Top Chef contestant Beverly Kim draw crowds for familiar Korean dishes injected with unlikely nuance. A typical Saturday night at Formento’s brings in 500 diners for 1950s-era Italian fare. The most popular dish is the tried-and-true Half Chicken Parmesan ($27), served with spaghetti Pomodoro and mozzarella. Other entrées include the Rabbit “Porchetta” ($23) with ramp sausage, smoked grapes and mustard greens and the 16-ounce Veal Tomahawk ($46) with salsa verde and turnip greens. Also following the throwback trend, the top-selling cocktail at Formento’s is the Pago Pago ($12), a tiki drink made with Caña Brava rum, Marie Brizard Crème de Cacao liqueur, Green Chartreuse, and pineapple and lime juices. Similarly, Melman and his partners—including celebrity couple Bill and Giuliana Rancic—opened RPM Steak in 2014 in homage to Chicago’s rich steak house history. “We often get asked why we’d do steak in a city that already has so many successful steak houses,” he says. “We saw it as an opportunity to build and expand upon that strong foundation by updating décor and menus and creating a noteworthy wine selection.” Food offerings run the gamut from a 16-ounce dry-aged New York strip ($59) to a 5-ounce grade A5 Miyazaki Wagyu beef ($85), and the restaurant pours around 400 different wines ($25 to $4,500 a 750-ml. bottle). 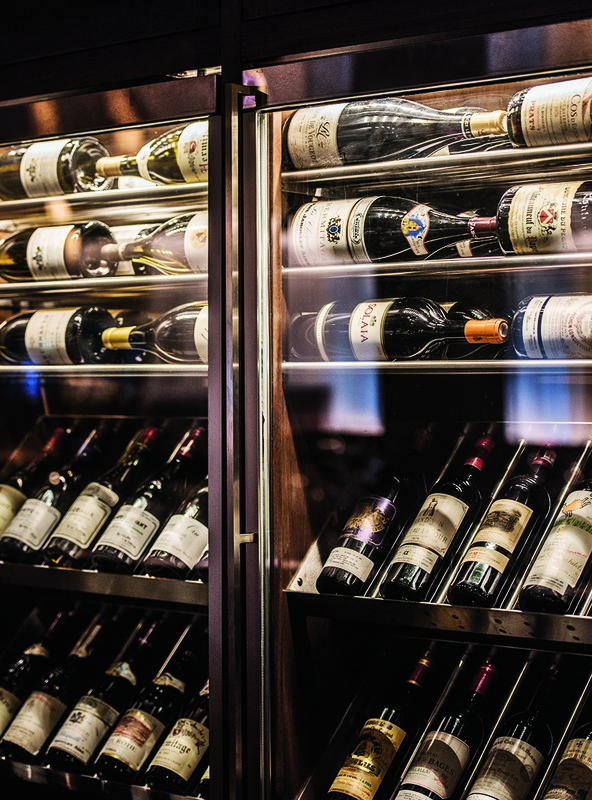 Top-selling labels include C. Donatiello Russian River Valley Chardonnay ($52) and the 2012 Round Pond Estate Kith & Kin Cabernet Sauvignon ($76). On the beverage side, Brinker of Barrelhouse Flat says you will still find remnants of the speakeasy fad, such as mustachioed bartenders wearing arm garters and using eyedroppers to make elaborate cocktails, but he notes “there’s a trend toward the casual bar: the dressed-down spot that makes cocktails without putting on a show.” Barrelhouse Flat’s menu focuses on the classics with a roster of 65 vintage drinks, but also showcases a dozen house specialties. Traditionalists often opt for the Old Fashioned ($13), made with Very Old Barton Bottled-in-Bond Bourbon, Demerara syrup, and Angostura and Regans’ No. 6 orange bitters, while others experiment with cocktails like the Mauve Lozenge ($14), made with Del Maguey Vida mezcal, Zucca amaro, St-Germain elderflower liqueur, pineapple, lime and Demerara syrup. 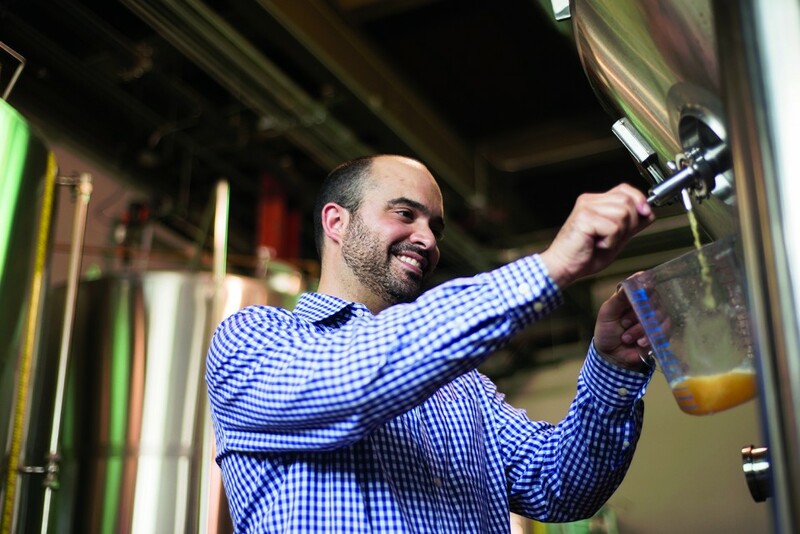 New producers like Moody Tongue Brewery (cofounder Jared Rouben pictured) have contributed to Chicago’s reputation for cutting-edge craft beer production. Chicago’s craft beer industry took off in 1988 with the launch of Goose Island Beer Co. The company pioneered the trend of barrel-aged beer and was acquired by Anheuser-Busch in 2011. Today, the craft beer scene is more crowded, with breweries like Half Acre Beer Co. and Revolution Brewing. At Binny’s Beverage Depot, a retailer with 31 locations in Illinois, Revolution Anti-Hero IPA ($9.99 a six-pack of cans) is the top-selling Chicago-made beer. According to beer buyer Pat Brophy, craft brewing has made a shift toward hyper-local production. “Some breweries are now servicing just a few neighborhoods, as opposed to the entire Chicagoland market,” he explains. Brophy says Arcade Brewery, Begyle Brewing Co. and Spiteful Brewing—whose beers ($7 to $10 a 22-ounce bottle) are sold at select Binny’s locations—do the bulk of their sales at nearby bars or from their tasting rooms. “Chicago is a breeding ground for the next generation of brewers,” says Jared Rouben, a classically trained chef and former Goose Island brewmaster who now operates Moody Tongue Brewery in the Pilsen neighborhood. He points to the Chicago-based Cicerone program and the Siebel Institute of Technology—the nation’s oldest brewing school—as two main incubators for local talent. Rouben, who studied at Siebel, draws from his culinary background to create Moody Tongue’s food-friendly beers, which include Sliced Nectarine IPA ($9.99 a four-pack of bottles) and Shaved Black Truffle Pilsner ($120 a 22-ounce bottle). Even Gino’s East, a deep-dish pizza behemoth with 14 locations, has begun brewing small-batch beer, such as Broken English IPA ($6.50 a 16-ounce pour), in one of its Downtown restaurants. “We’re hoping to capitalize on our strong brand and attract local beer geeks,” says Gino’s brewmaster Kevin McMahon, who also honed his skills at Siebel. In 2008, Koval became the first distillery to operate within city limits since Prohibition. Best known for its organic whiskey, Koval is joined by Few Spirits, North Shore Distillery and Letherbee Distillers as the more established homegrown spirits producers. At Binny’s, the top-selling local spirits are North Shore gin and Letherbee gin (both $29.99 a 750-ml. bottle), according to specialty spirits buyer Brett Pontoni. In 2013, Tremaine Atkinson and Mark Lucas cofounded CH Distillery in the West Loop. Launched as a “grain-to-bottle” producer after Atkinson completed a distilling course at Siebel, CH focuses on vodka and sources the grains for its spirits from just 50 miles away. “It just makes sense to create spirits with local ingredients—brewers have done it for years,” he says. 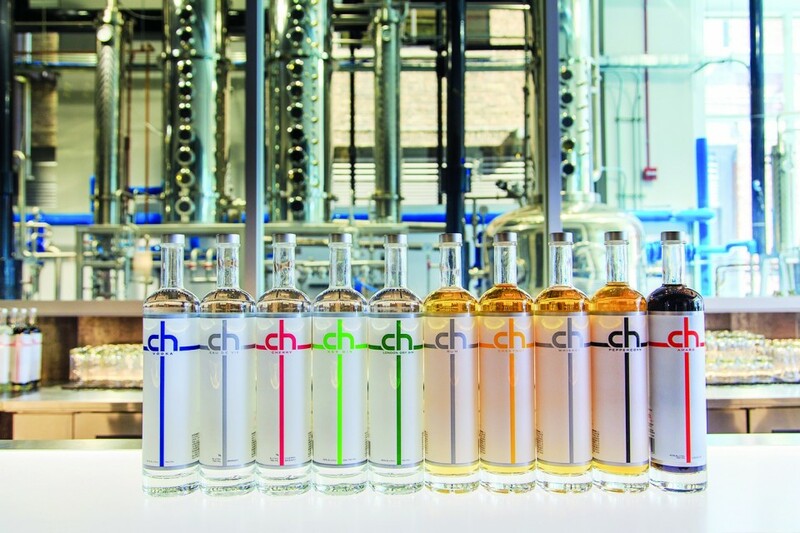 CH produces its top-selling vodka ($28 for a 750-ml. bottle), along with gin, amaro and Bourbon. Seasonal offerings have included a series of brandies (all $35 to $37 a 750-ml. bottle) made with peaches, pears and cherries from Michigan. While the bulk of sales occur at Illinois bars and restaurants, guests can also taste CH’s offerings at the distillery’s on-site bar and restaurant, either neat or in specialty cocktails like the Cease and Desist ($11), made with Lapsang souchong tea–infused CH Dry gin, fresh ginger, honey and lemon juice. Small plates like gnocchi with pork belly, roasted mushrooms, shaved pecorino and herbs ($13) complement the spirits. “The craft spirits scene in Chicago is vibrant and as good as anywhere in the country,” Pontoni of Binny’s notes. The same can be said of the city’s culinary and brewing cultures, which are built upon a strong foundation of tradition and pride, and fueled by an innovative new guard of artisans and operators.